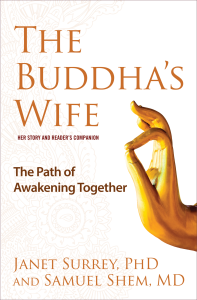 In The Buddha’s Wife story, Yasodhara and the others in her community, “go forth together,” and not alone as did the Buddha. Their path points to the power and centrality of sangha, of community, in spiritual awakening. This goes beyond the power of people supporting the awakening of each other individually. In a community of awakening, it is through the fact of being in community that awakening occurs. It depends on the quality and depth of real-time spiritual connection within the community. This suggests that the community itself is called to go forth, to fully awaken and transmit in a new way. Thich Nhat Hanh recognizes the primary importance of the sangha for his western students. In the West, he acknowledges, there is vast suffering of isolation and separation–psychological separation from family and community–and he understands that “learning to be and see with sangha eyes” is of primary importance in awakening. Awakening community implies a double doorway; an awakening of the community to its own powerful nature of interbeing and interconnectedness, and also becoming a vehicle of awakening for all who enter it.